This first one is from Russia. The postcrossing project asks that all cards be written in English (unless the person you are writing to has specified they can read another language), but unfortunately this one is written IN Russian so I’m not sure what was said. The handwriting is very flowy and beautiful though! 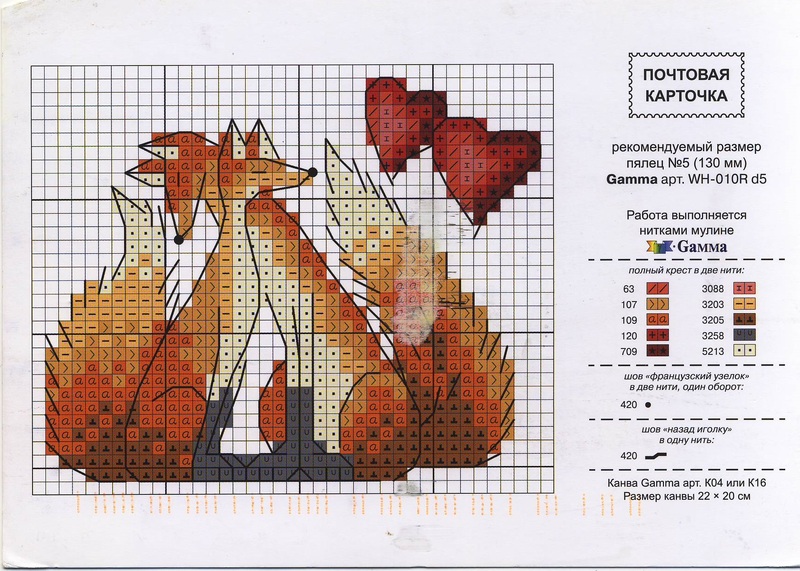 I like this card for the foxes, but also for the unusualness of it being what looks like possibly a cross-stitch pattern? I’m terrible at handicrafts though I do have distant wishes of one day knitting and crocheting and cross-stitching. Tatting is about the only thing I ever picked up and only briefly. This person tells me that Cape Town is their hometown but that they love to travel. They haven’t been to the United States yet, but have seen many parts of Europe. Afrikaans is their native language and they tell me that it is very similar to Dutch. I love languages, but have a horrible time pronouncing Dutch. I wonder if I’d be any better at Afrikaans? I admit that I love food cards. Not just because I love food, but because it is so very different all over the world! This card comes from Austria and from a woman who says she is a chocolate confectioner by profession. Yum!! 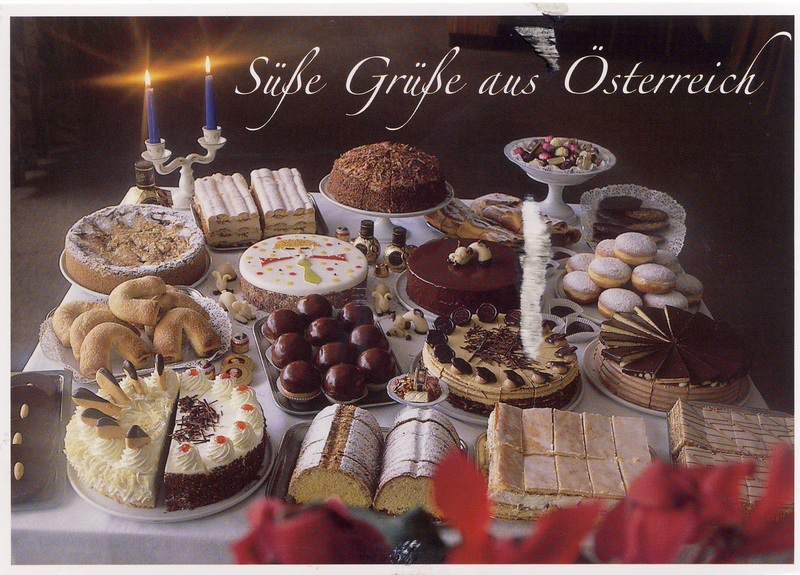 The greeting on the front translates to “Sweet greetings from Austria”. It’s a shame I’m not able to sample some of her own creations! Illustration cards from various parts of Asia are some of my favorite cards I receive. Even though the art styles and subject matter vary widely I can’t help but fall in love with them. This adorable monkey comes to me from Taiwan. 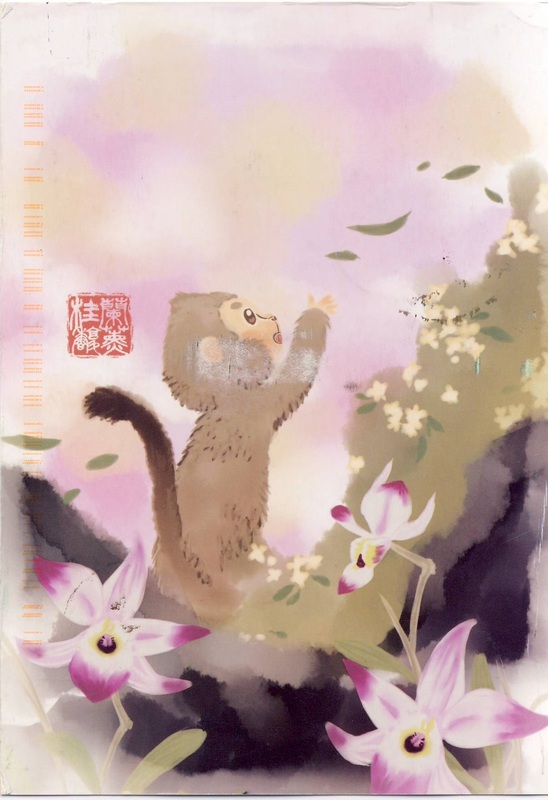 It isn’t the year of the monkey right now in the Chinese zodiac calendar, but this little guy seems content to enjoy what looks to be a lovely springtime day while he waits for his moment in the spotlight again. The final card in this post is from Canada. 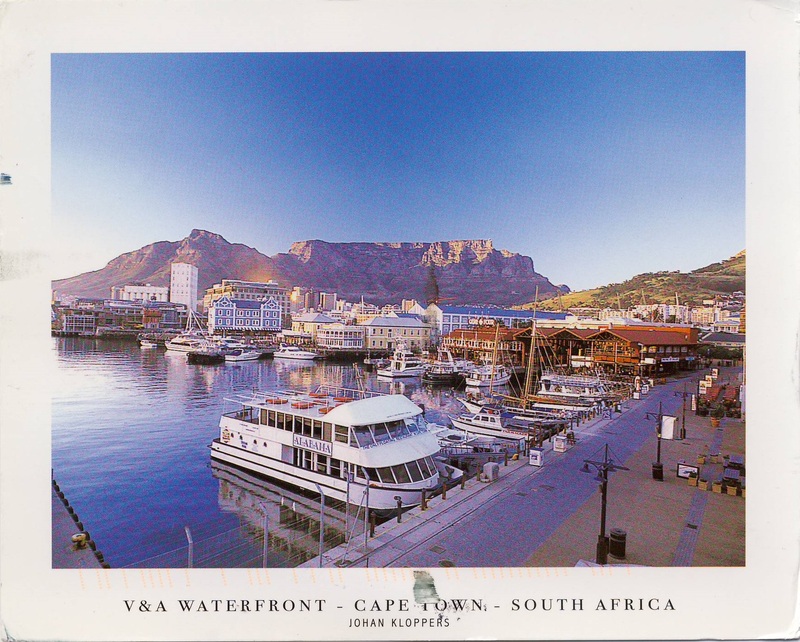 Postcards don’t always have to come from far away for me to love them! 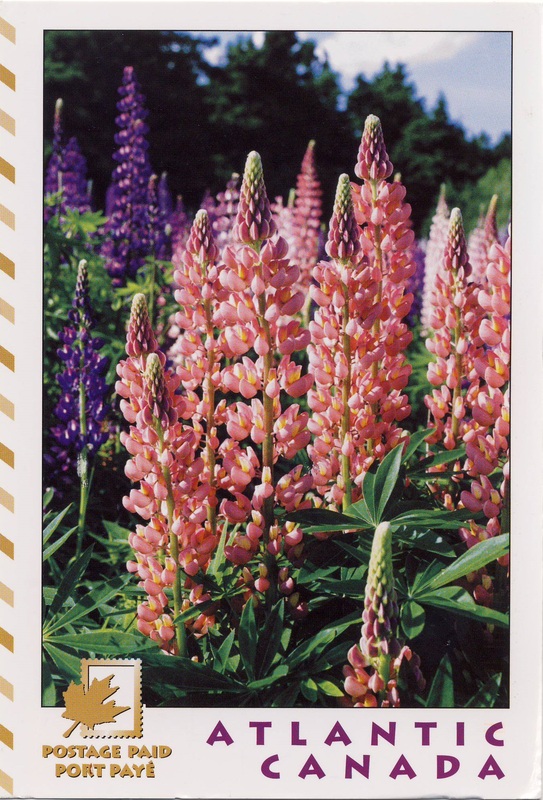 These flowers are lupins and the sender tells me she has a lot of them growing at her home. I think they’re gorgeous! Maybe someday I’ll get around to planting flowers at my house… in the meantime I’ll stare at the beautiful flowers that come to me on postcards. Have a favorite? I’ll share more again later in the year once I’ve sent (and received) more cards! That looks like so much fun! I might have to sign up once we get settled somewhere more long term. I definitely recommend it! One of the things I love is that you can participate as much or as little as you want to. Some people end up sending a hundred cards a month. Some people send just a handful all year. It’s whatever you want! I did Post Crossing for a little while and it was fun! I had to take a break due to moving, but maybe now that I’m settled, I will start again. I really like the Monkey one from Taiwan too. I think my favorite one I’ve received in the past is is either one from Russia (it looks like a watercolor print!) or one from the Netherlands (it’s just pretty with a sunset and a windmill overlooking a creek). I’ve taken a few breaks off and on over the last few years, but I love that it’s something I can easily come back to when I’m ready. This is such a cool thing to me! How do I get in on this? Go to http://www.postcrossing.com and sign up! The account is free and you only have to do as much of a profile as you want. When you first start out they’ll give you a limited number of cards you can have in the mail at a time, but the more you send the more your ‘traveling limit’ will increase. Do as much or as little as you want!